DURATION: 2 hr. 55 min. 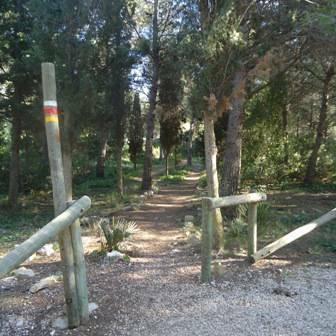 ACCESSIBILITY: We arrive at the end of Les Rotes by taking the promenade next to Marineta Cassiana beach. We walk in a South direction and can explore rocky coves whose sea bottoms house a priceless wealth of local flora and fauna. Once we arrive at the end of Les Rotes promenade, we can see the watchtower called Torre del Gerro, which indicates the end of the ascending section with the steepest slope in the route. A few kilometres into the route, we can enjoy a wide variety of landscapes and panoramic coastal views of Les Rotes, Dénia, Gulf of Valencia, the Xàbia Bay, Mt. Montgó, and even the islands of Ibiza or Mallorca on clear days. 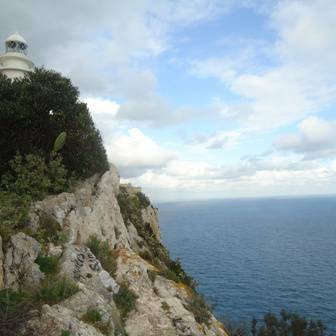 This route crosses through Les Planes, a plain which merges into the sea, on steep cliffs of the cape: Cabo de Sant Antoni. The path travels through scrubland, woods and old terraced areas of abandoned farm plots. In Les Planes, we highlight “Els Molins” (windmills) which are visible from the Bahía de Xàbia, the recreational area of La Plana de Sant Jeroni and the scenic viewpoint near the lighthouse. Another option to reach the end of Les Rotes is to use the Urban Bus Service: Autobuses Dénia (Tel. 966421408) in the Dénia Port. Return to Dénia. From March to October, there is a boat transport service between Dénia and the Xàbia Port, where you may return to Dénia by sea (Mundo Marino, Tel. 966423066). The return by boat is a pleasant way to end the route where you may admire a sea view of the impressive cliffs with their caves and capricious rock formations. From the boat, we can easily recognize the layout of the route that we have hiked earlier. We sail on waters which have been declared a Marine Reserve due to their enormous biodiversity. All the sea wildlife which can be found in the 518 km coast of the Valencian Community also inhabit these waters in front of Cabo de Sant Antoni.